Those streaks were inflicted primarily during re-entry to Earth's atmosphere, when Discovery experienced temperatures of up to to 3,000 degrees Fahrenheit (1,650 degrees Celsius). 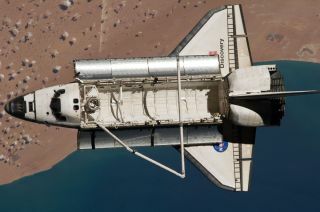 Discovery flew 39 space missions during its operational life, more than any other space shuttle — or any other spacecraft in history, for that matter. The orbiter blasted off for the first time in August 1984 and touched down for good in March 2011. Over the course of its 39 flights, Discovery logged a total of 365 days in space and put 148,221,675 miles (238,539,663 kilometers) on its odometer. That's the equivalent of more than 300 roundtrips to the moon. For comparison, the shuttle Atlantis flew 33 times, and Endeavour lifted off the pad 25 times. Columbia and Challenger notched 28 and 10 space missions, respectively, in their tragedy-shortened careers. Astronauts aboard Discovery deployed NASA's Hubble Space Telescope on the shuttle's STS-31 mission in April 1990. Five subsequent missions, launched aboard a variety of shuttles, repaired and upgraded the sensitive instrument. Hubble celebrates its 22nd anniversary in space this year and continues to snap stunning photos that increase our understanding and appreciation of the cosmos to this day. In 2011, it made its millionth science observation. Discovery was the first shuttle to launch after each of the shuttle program's two fatal tragedies, the January 1986 loss of Challenger shortly after liftoff and the Feburary 2003 destruction of Columbia as it re-entered Earth's atmosphere. Each disaster took the lives of all seven astronauts aboard. In both cases, the shuttle program took several years to get back on its feet. Discovery's return-to-flight missions launched in September 1988 and July 2005, respectively, following substantial safety modifications for the orbiter fleet. Discovery is the only shuttle ever to fly one of the Mercury Seven — NASA's first astronaut class, which was chosen in 1959. The orbiter carried John Glenn on its STS-95 mission in October 1998, when the astronaut (and sitting U.S. senator) was 77 years old. On the flight, Glenn became the oldest person ever to reach space. Thirty-six years earlier, in 1962, he had become the first American to orbit Earth. Note: An earlier version of this story stated that Discovery flew the STS-93 mission in 1999. Columbia actually made that flight, and the story has been corrected to reflect that fact.